The Science Festival is fast approaching! You, the brightest minds of this generation, compete with ingenuity to tinker, in your craft lab, the most original and powerful bid! Will you be able to master the four energies and build the combos that will make you win the first prize of this scientific competition? 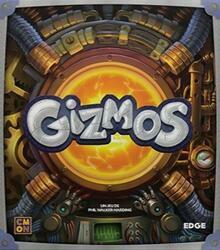 Gizmos is a logic game where you have to be cunning to build the most absurd machines: you will draw energy in the distributor to fuel inventions of all types and you will face your opponents in a race to the points of victory , all this to win the Grand Prix of Science Day! With each new game of Gizmos, you will design new inventions, real wacky gadgets, but you will learn how to combine their devastating effects!